The story of Thieves oil has always been an example of the evolution of medicine and and example of how many old medicinals have fallen into obscurity. Historically, doctors would use herbs and plant compounds to heal and protect from ailments. 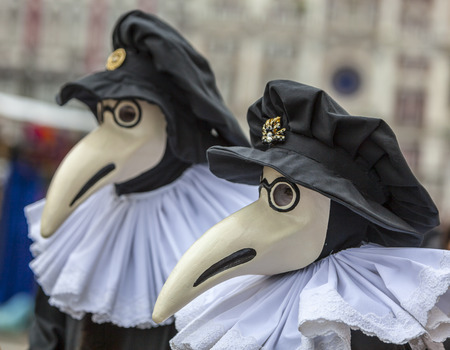 The masks they wore had long, curved snouts, and the doctors would fill the snouts with herbs to combat the smell of those infected by the plague. Not only was this used to protect them from the awful stench, but they also used it to prevent contracting the horrible disease. Most people believed that the plague was being spread by poisonous vapors in the air. Thus, the Medico della Peste was created. Doctors aren’t thieves, I know you’re thinking this! I’m supposed to be telling the story of thieves, not doctors! Well, the doctors kind of got the idea from a group of French thieves, who were spice traders. These spice traders understood the medical properties of natural herbs and spices better than anyone. It’s been said that they would soak bandanas in a combination of specific spices to wrap around their faces while they loot the houses infected by the plague. No one else would go in there for fear of succumbing to the terrifying disease. The French thieves used Four Thieves Vinegar, or Marseille Vinegar. There have been various recipes floating around, but one particular recipe stated that it is a combination of rosemary, sage, lavender, rue, camphor, garlic, cloves, and distilled wine vinegar. By combining the different ideas of the various recipes and using current research on plant compounds, Gary D. Young, the founder of Young Living Essential Oils, has fine tuned it to what he believes is the most powerful combination of plant compounds to combat most viruses, fungi, and bacteria. The Young Living brand Thieves oil is a combination of rosemary,cinnamon, clove, eucalyptus, and lemon oils, each having individual, profound healing properties. These oils create a delightful aroma that also aids in preventing sicknesses and helping you heal from a sickness.